Deep in the frozen forests of Russia’s far east, one of nature’s most elusive — and surely most majestic — predators has been staging a quiet comeback. Siberia’s tigers, also known as Amur tigers, are the largest subspecies of the great cats of Asia. They have survived wars, poaching and extensive habitat loss to claw their way back from just a handful of animals to a renewed position of viability. In a football field-sized enclosure, about an hour from the city of Vladivostok, Elena and Pavlik are good examples of why that’s happening. The 15-month-old male and female siblings are, for the moment, the only residents of the Amur Tiger Rehabilitation Centre near the village of Alekseevka. The centre includes a large natural area that imitates tiger habitat, with typical trees, shrubs and landscape. It’s fenced in, with the outside world obscured by a green tarp. ​”They have learned how to hunt down prey, to catch and kill, and most importantly, they completely avoid humans,” said Viktor Kuzmenko, who oversees the unique facility. It was established with a grant by the Russian government and other non-governmental organizations such as the World Wildlife Fund in 2013 to preserve, study and increase the Siberian tiger population. The young tigers were taken in by wildlife officials last summer after their mother repeatedly visited a local village and ate people’s pets. Killing problem tigers in Russia is illegal, so the only option was to capture her and relocate her to a zoo. “At this age, the cubs wouldn’t have survived without their mother,” Kuzmenko told CBC News, so they were brought to the centre. Since then, the goal has been to teach them how to hunt and survive on their own. At meal time, usually in the late afternoon, a deer, boar or other creature is released into their area and the tigers instantly snap to attention. On TV monitors, it’s possible to see the young carnivores creep up on the unsuspecting animal and pounce with lightning fast reflexes, sinking their teeth into its neck and waiting for the stricken animal to bleed out. “Their behaviour is almost perfect,” said Kuzmenko, who expects the pair will be released into the wild this spring and will have a strong chance of making it on their own. A century ago, Siberian tigers ranged as far west as the Caspian Sea and across the vastness of Russia and China to the shores of the Pacific. But they were hunted relentlessly for their furs and body parts. By the end of the Second World War, just a few dozen of the animals were left in the wild. The Soviet Union brought in strict rules on hunting and the population recovered somewhat before falling again after the collapse of communism in the 1990s, when hunters were able to more easily cross the border with China and a lucrative black market re-emerged. Since 2010, the Russian government has cracked down on poaching and implemented a host of conservation measures that have helped Russia’s Far East tiger population grow to around 500 adults and perhaps 100 cubs, according to a 2018 census done by Russia’s Ministry of Nature. While hardly robust numbers — Siberian tigers are listed as endangered, according to the World Wildlife Fund — the trend line is increasing. Russian authorities believe within four years, the tiger population will grow to more than 700 animals. Worldwide, about 5,000 tigers remain in the wild, including the population in Russia as well as other sub-species in India, Bangladesh, Nepal and South Asia, according to the WWF. In Russia’s Primorye region, where China borders to the west and North Korea to the south, the beasts are treated with near mythological reverence. “Entering a forest in the Far East, you feel a fairy tale and a sense of the unknown because this is the home of the tiger,” said Sergei Aramiliev, a biologist who is the director the Amur Tiger Centre, the agency that operates the rehabilitation centre and undertakes other conservation activities. In and around Vladivostok, there are murals, billboards and statues of tigers, emphasizing the connection the animals have with the region’s identity. Russian President Vladimir Putin, who’s often photographed in Russia’s wilderness in the company of wild animals, has posed frequently for photo ops with Siberian tigers, most of which were associated with the rehab centre. Russia’s government has pays for many of other conservation measures, including a half-kilometre long so-called Tiger Tunnel, which was opened on the highway to the city of Khabarovsk two years ago. It allows tigers to cross over top of the road that dissected important tiger habitat. But perhaps the most important efforts have focused on illegal hunting, which continues to be the animals’ greatest threat, said Aramiliev. “The laws have tightened,” he told CBC News, noting that eight years ago, between 50 to 70 tigers a year were lost to poaching. Now, he said, the number is closer to 15 to 20. The market for their furs and body parts, used in traditional medicines and ceremonies, is almost exclusively China, he said. China has also enacted legislation to halt the trade in such animal parts but Russian authorities say illegal cross-border transactions continue. 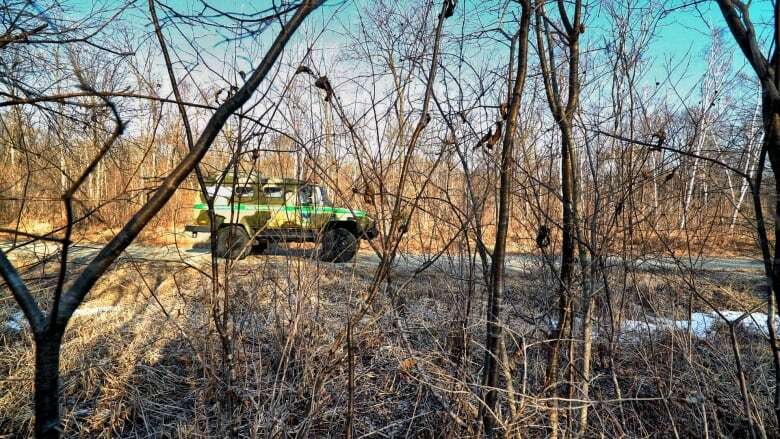 More than 14 Russian conservation teams, made up of more than 100 full-time members, now patrol key tiger habitats in military-style armoured personnel carriers, looking for poachers. 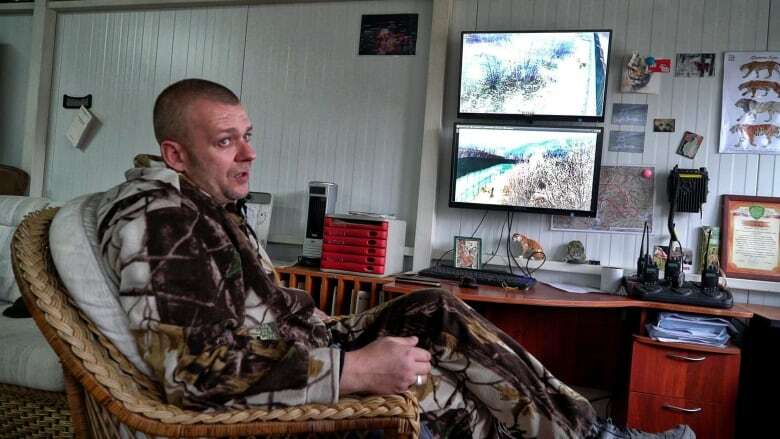 On a recent trip, Andrey Zakharov, the leader of one group, told CBC News his officers will often camp out overnight deep in the forest, watching for tiger tracks in the snow or suspicious vehicles. Russian TV routinely covers stories of villagers in the Primorye region who have had their pets killed by tigers or been stalked themselves. Over New Year’s, one woman from a village near Khabarovsk showed a TV crew the blood stains from where a tiger tried to drag her pet through a fence before the fortunate dog escaped. The mother of the two young tigers now at the rehabilitation centre was captured after she repeatedly returned to a village, eating a total of 10 family pets. 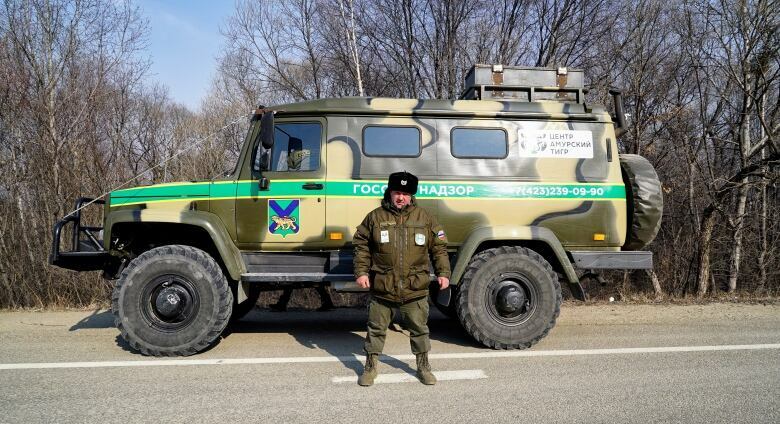 “As the human population has grown, we have occupied [the tiger’s] territory,” said Zakharov. To deter people from taking matters into their own hands when conflicts occur, local authorities now offer monetary compensation for any livestock or pets killed. “There are cases where tigers attacked cows, horses, dogs, but if a person has all the proper documents, we will reimburse everything. People will receive financial compensation without delay,” said Zakharov. Still, there have been setbacks. CBC News was initially invited to the Tiger Rehab Centre to witness a medical examination of an older tiger named Tikhan. The 13-old-male had been acting unusually in early January, coming near a Russian border office and attacking the soldiers’ dogs. After biologists tracked and tranquillized him, they discovered Tikhan had problems with his teeth, so they performed dental surgery. That was expected to allow him to return to the wild. But by the time the CBC crew arrived at the Tiger Centre after a long flight from Moscow, Tikhan had died suddenly. Instead, we witnessed his autopsy. Thirteen years is about the average lifespan for tigers in the wild, although in captivity they can live to be older than 20. Tests determined Tikhan was 142 kilograms at his death, far less than the usual 300-kilogram weight for a healthy male. As it turns out, scientists learned that his body was badly dehydrated and he was suffering from exhaustion. The final cause of death was ruled as being from natural causes. Even so, Aramilev said Tikhan played a key role in ensuring the survival of his species.